Jute bags labelled with our motto „14km – The shortest distance between North Africa and Europe“ are available here! These fair-trade, hand-made jute bags are produced especially for you! You can purchase one (or more!) for 10 EUR* per bag at our next event, such as the 14km Film and Discussion Series. Alternatively, we can deliver if you pay the extra shipping costs – simply email info@14km.org to place and order. Buy a bag and wear a statement of just how close our cultures are! 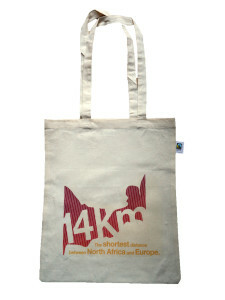 * By purchasing a 14km jute bag, you help support our non-profit, volunteer work.